It's Monday again. I had a fabulous weekend of reading. I read more over the weekend than I have read in the past couple weeks combined! It started with the 24 Hour Readathon. I managed to read for about 8 hours on Saturday and got through about 250 pages (I'm a slow reader!). My son joined me for a couple hours and read about the same number of pages. I will point out that he was reading YA and I was reading a Geraldine Brooks book that required a lot of concentration. By late Saturday night, I had started After You by Jojo Moyes. I only read about 50 pages on Saturday night before getting too tired to continue. I picked it up on Sunday morning and read another 200 pages! I'm almost done with it - made myself put it down at 1am since I had to work today! I didn't end up blogging much last week. I didn't even do a wrap-up of the readathon! But here are a couple links. This week is the Travel the World in Books Readathon hosted by several bloggers including Tanya at Mom's Small Victories. I haven't actually signed up for it, but I did spend several hours reading a book that takes place in another country yesterday, so I probably should! I finished reading The Secret Chord by Geraldine Brooks on Saturday. And I'm almost done with After You by Jojo Moyes. After that, I'll be moving to my October book club selection: The Cuckoo's Calling by Robert Galbrait/J.K. Rowling. Carter finished Eldest by Christopher Paolini and is waiting for the next one to be available in the library. In the meantime, he read This Book is Not Good for You by Pseudonymous Bosch and is now reading the next book in that series. M is still reading Harry Potter and the Prisoner of Azkaban. What are you reading this week? It's Monday! is hosted by Sheila at Book Journey. 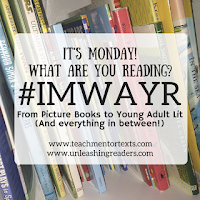 Also check out the younger version of It's Monday! This post includes Amazon Affiliate links. If you purchase something using my link, I will receive a very small commission but your price does not change. I keep meaning to join in a Readathon. Sounds like you had fun...I want to read After You. Since I spent all day at a book festival on Saturday, I had very little time to actually read. The festival was wonderful though. Come see my week here. Happy reading! ENJOY your week. Looks like you had a terrific week of reading last week. I really enjoyed After You and sounds like you did too. Me Before You was one of my favorite books. Is this newest one just as good? It's a wonderful continuation of the story, but it is not nearly as good or deep as Me Before You. I do recommend it for anyone who enjoyed Me Before You, though. These sound like great books here. I like how you mention what your kids are reading. I should do that too. I have LOVED every novel of Geraldine Brooks - she is one of my favorite authors - can;t wait to hear what you think about this new one. Your kids have moved up to the Eragon series and the Harry Potter series? Wow, they have grown up so much since I first started reading your blog! That is so cool, to see them grow up by the books they read. My oldest son LOVED Paolini's series. It is very cool that they are reading these series now. I love seeing my youngest getting absorbed in more difficult books, and I really love being able to share more books with my oldest now! I get to have a mini readathon every day, thanks to my two-hour bus commute! ;) I read the first book in the Eragon series but never got around to reading the rest, I really ought to pick them up again. I love the cover for After You (very 1980s) but don't think the book is quite for me. Sounds like your son is deep into a lot of different fantasy series! You should check out the new Fablehaven guide, and maybe the John Flanagan Ranger's Apprentice series-- both very popular with my students and sure to keep him reading for hours! Thank you! I'll recommend those when he finishes this one. Yes, he is very much into fantasy stories! I just finished reading After You as well. I loved Me Before You, but sadly the sequel didn't live up to its predecessor sadly. I still appreciate it though! I agree. It was a nice story but not amazing like the first one. I found it more of a way to wrap up her life a bit more, but that's about it. I love doing Readathon and realizing how much more I've read than usual! How did you like The Secret Chord? I just started it yesterday. I liked it but it required a lot more concentration than usual. I will definitely read another of her books at some point. I need to write my review! Hoping to find the time today. It sounds like you had a productive readathon! I loved Pseudonymous Bosch - really enjoyed that series but haven't caught up with it yet. I think I've read the first three. I haven't joined the Readathon for awhile now. Maybe next year.